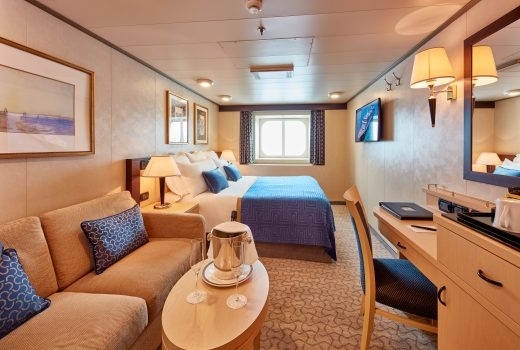 At 152-243 square feet these staterooms provide spacious comfort. Queens Grill takes everything that is so wonderfully indulgent about our Grills Experience and raises it to exalted new heights. Luxuriate in your own secluded haven of up to approximately 2,131 square feet. Featuring marble bathrooms and whirlpool baths. An expansive private balcony commands impressive sea views, perfect for sipping champagne or curling up with one of the books on offer. Refrigerators are stocked to your preferences; your concierge or butler will gladly attend to your every whim. Guests dine at a reserved table in the single seating Queens Grill Restaurant. 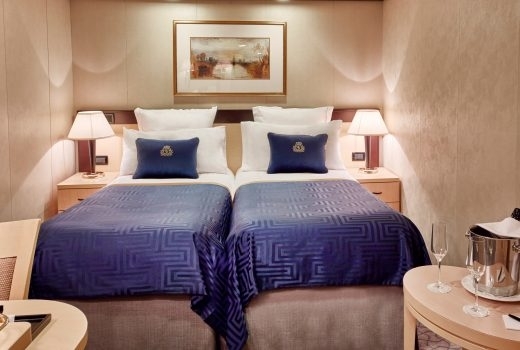 Queen Victoria's Grand Suites on Decks 6 and 7 are the most lavish suites afloat. Offering expansive living and dining areas, a bathroom with bath and shower, and an oversized balcony. Queens Grill takes everything that is so wonderfully indulgent about our Grills Experience and raises it to exalted new heights. Luxuriate in your own secluded haven featuring marble bathrooms and whirlpool baths. An expansive private balcony commands impressive effect for sipping champagne or curling up with one of the books on offer. Refrigerators are stocked to your preferences; your concierge or butler will gladly attend to your every whim. Guests dine at a reserved table in the single seating Queens Grill Restaurant. 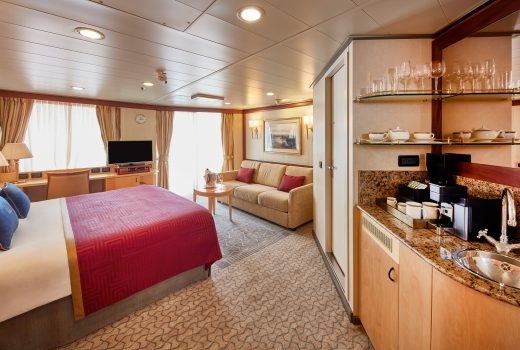 Situated on Deck 7, Queen Victoria's expansive Master Suites offer a living area, bathroom with bath and shower, and a balcony.